I was invited by my fellow foodie and good friend Stacy to try the newly-opened milk tea shop at The Strip, Ortigas: True Blends. More than just a milk tea shop, True Blends also has the Cheese Cloud drinks, Yakult Series, Green Tea Series, Italian Soda and Coffee! I'm glad that milk tea shops nowadays add non-milk tea drinks in their menu. My friends had the Milk Tea Blends: Passionfruit (Php 60 for grande, Php 70 for venti) and Wintermelon (Php 60 for grande, Php 70 for venti). Killjoy me got a Mango Yakult (Php 85 for grande, Php 95 for venti). But what I like most in True Blends is the Cheese Cloud Series. We got to try the Oreo Dark Choco Cheese (Php 100 for grande, Php 110 for venti), but my ultimate favorite is the Dark Chocolate Cheese Cloud (Php 90 for grande, Php 100 for venti). The cheese cloud is just smooth and creamy. I should ask for an extra shot next time. Aside from the drinks, True Blends also serves sandwiches and sausages. We got to try the Schublig Sausage (Php 120) and the Garlic Stuffed Bread (Php 25 per piece). For sandwiches, we had the Hazelnut-Banana Sandwich (Php 55) and the Clubhouse Sandwich (Php 90). True Blends offers really affordable and yummy drinks. It's a plus that they also serve snacks. You can also pass time in this place as they also have free wifi. 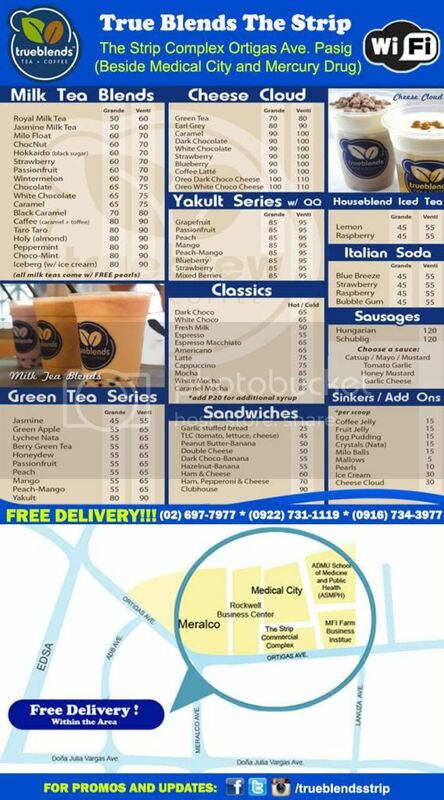 They also offer free deliveries within the area. I'd love to try the coffee drinks next time. 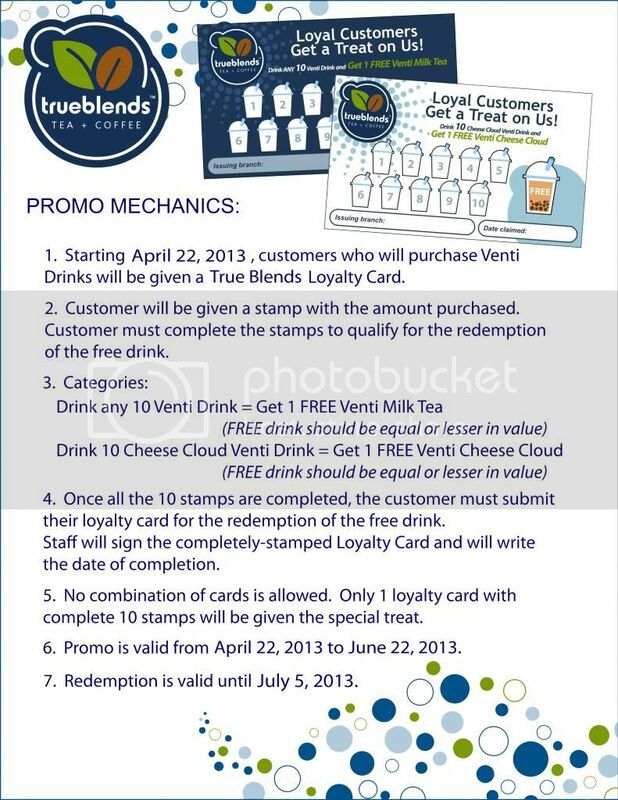 Read the promo mechanics of their loyalty card promo here. Thanks to Stacy Liong for having us. Looks yumyum. Perfect for the summer! :) And affordable ha. Is this the one near Medical City? I want to try Lychee Nata. Sounds yummy and very affordable! Nice seeing you again Michi! At sa True Blends pa :D Love the drinks and of course, the bonding moment.